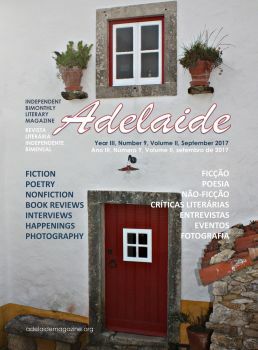 photography, as well as interviews, articles, and book reviews, written in English and Portuguese. We seek to publish outstanding literary fiction, nonfiction, and poetry, and to promote the writers we publish, helping both new, emerging, and established authors reach a wider literary audience. We publish print and digital editions of our magazine six times a year, in September, November, January, March, May, and July. Online edition is updated continuously. There are no charges for reading the magazine online.